Day two of the WMOF included 28 keynote and breakouts and a message of hope that “The family has a future and is the salvation of humanity”. The second day of the Pastoral Congress of the WMOF in Dublin, Ireland, included 28 keynote and breakout sessions, as well as a message of hope to the world: “The family has a future and is the salvation of humanity”. Some of the morning panels tackled broad topics such as human trafficking, the role of grandparents in family and supporting newly married couples in the parish. The morning session came to an end with two presentations. The first, lead by Cardinal Maradiaga, was entitled “Pope Francis on the revolution of tenderness”. The second was a workshop led by Rocco Buttiglione, from the Communion and Liberation Movement, entitled “A hidden treasure: the Theology of the Body of Saint John Paul II”. The second session of the morning began with a panel on the “Dignity and Beauty of Sexual Love”, moderated by Cardinal Blasé Cupich, Archbishop of Chicago and involved a guest speaker from Colombia, José de Jesùs Magana. Prior to the celebration of Holy Mass, couples who are celebrating 25, 50 and 60 years of marriage. discussed love and fidelity in the midst of difficulties. Pope Francis awaits a meeting he specifically requested with engaged and newly married couples, and 350 Irish couples await his visit. The first pastoral portion of Pope Francis’ Apostolic Journey to Ireland for the World Meeting of Families will occur on Saturday afternoon when he visits Dublin's St Mary's Pro-Cathedral. There he will meet with 350 engaged and newly married couples. Fr Kieran Mc Dermott, the newly-appointed administrator of Dublin’s St Mary's Pro Cathedral spoke with Vatican News about what will happen during this event and about the importance of St Mary’s Pro-Cathedral for the people of Ireland. DUBLIN - Organizers of a rival event to this week’s World Meeting of Families in Dublin have taken issue with what they charge is a “watered-down” version of Church teaching on offer at the Vatican-sponsored summit that endorses homosexuality, adding that bishops have been too “sheepish” about speaking out. “The Church has become, and when I say ‘the Church’ I mean bishops, has become almost embarrassed to preach the Gospel and to preach the Christian message on family and marriage,” Anthony Murphy, founder and editor of the “Catholic Voice” newspaper and founder of the “Lumen Fidei Institute,” told Crux in an interview. “It’s this kind of secularization of the bishops’ conferences which I think is the greatest enemy of the Church,” Murphy said. Pope Francis arrived in Dublin, Ireland, on Saturday morning around 10:30 local time beginning his 24th Apostolic Journey in which he will participate in the World Meeting of Families. He was welcomed by the Apostolic Nuncio Archbishop Jude Thaddeus Okolo, the Tánaiste, or deputy head of Ireland’s government, Simon Coveney, Cardinal Farrell of the Diacastery of Laity, Family and Life who has organized the World Meeting of Families, the President of the Irish Episcopal Conference, Archbishop Eamon Martin, the Archbishop of Dublin, Diarmuid Martin, and other members of the hierarchy in Ireland. Pope Francis pays a courtesy visit to the President of the Republic of Ireland, Mr Michael Higgins, at Áras an Uachtaráin. He signed a book of honor and met in private with the President. "With gratitude for the warm welcome I have received , I assure you and the people of Ireland of my prayer that the Almighty God may guide and protect you all." On a visit to Dublin, Ireland, on the occasion of the World Meeting of Families, Pope Francis on Saturday addressed authorities, civil society and the diplomatic corps. Pope Francis on Saturday called on the international community to create a global family of nations and peoples with a sense of unity and solidarity, especially with the weakest of our brothers and sisters. While calling for the protection of the vulnerable, he also denounced the “grave scandal” of clerical sexual abuse of young people by members of the Church in Ireland as “repellent crimes”. 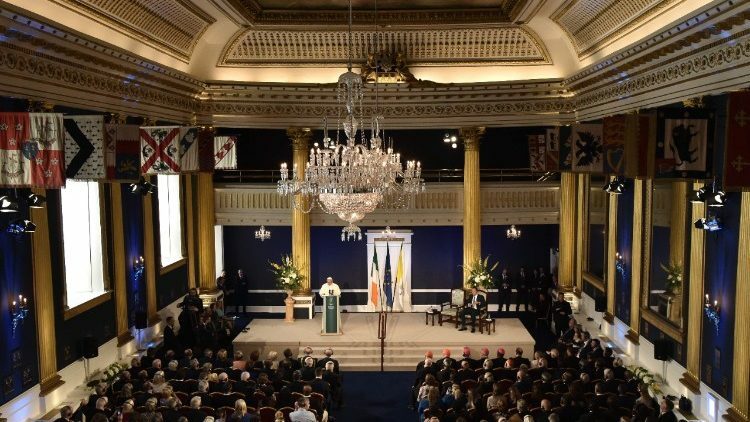 The Pope’s call came in his address to Irish authorities, civil society and the diplomatic corps at Dublin Castle, part of his 2-day visit to Dublin, Saturday and Sunday, on the occasion of the World Meeting of Families which is taking place in the Irish capital, August 21-26. The first pastoral portion of Pope Francis' 24th Apostolic Journey happened on Saturday afternoon with a visit to Dublin's St Mary's Pro-Cathedral where he met with about 400 engaged and newly married couples. Pope Francis met with about 400 engaged and newly married couples from all of Irelands 26 dioceses. He spent some quiet moments in prayer before the Blessed Sacrament where a candle has been lit since 2010 in memory of all the victims of institutional and clerical abuse in the Church. He then listened to the greeting of a couple celebrating their 50th anniversary of marriage, and received 2 questions – one each from an engaged couple and a newly married couple. Pope Francis visits the Capuchin Day Centre in the heart of the city of Dublin where he met with the Capuchin Fathers, employees, volunteers and homeless persons. Greeting the Pope on his arrival on Saturday was Capuchin Friar, Brother Kevin Crowley, founder of the Day Centre, and his team. Br Kevin has seen Ireland during the most difficult of times including recession in the 1980’s and most recently the financial crisis that hit the country. DUBLIN (CNS) -- Pope Francis spent 90 minutes meeting privately with eight survivors of sexual, physical and emotional abuse at the hands of Catholic clergy or in Catholic-run schools and institutions. The meeting took place at the Vatican nunciature in Dublin Aug. 25, the first day of Pope Francis' two-day visit to Ireland, the Vatican press office announced. Afterward, two of the survivors published a statement describing the meeting. They said, "Pope Francis condemned corruption and cover-up within the church as 'caca' -- literally filth as one sees in a toilet, his translator clarified." Months of preparation went into creating the event considered one of the highlights of the World Meeting of Families 2018: the Festival of Families that was celebrated in Dublin’s Croke Park Stadium on Saturday evening together with some 70,000 people. Even the stage design reflected an ideal “circle of encounter” where families could sit close to Pope Francis while sharing their testimonies and enjoying the performances. The talent was provided by some of Ireland’s best performers and musicians: a 1,000-voice choir, a 50-piece orchestra, and over 700 dancers from the best Irish dance schools across the country, as well as international artists like The Riverdance Troupe, American jazz singer, Dana Masters, and Italian tenor, Andrea Bocelli. The testimony came from five families representing Ireland, Canada, India, Iraq, and Africa. All shared a common theme of how their families had provided them with hope, love and support during the most challenging moments of their lives. Their testimonies focused on themes of forgiveness and hope in the family, the importance of grandparents, and even the role of social media and technology in family life. When the Pope addressed the gathering, he described it as “a family celebration of thanksgiving to God for who we are: one family in Christ, spread throughout the world”. Pope Francis’ speech was filled with references to his Apostolic Exhortation, Amoris Laetitia, on the joy of love. Pope Francis traveled by air to Knock for his only stop outside of Dublin on his 24th Apostolic Journey. We bring you the video, an audio report as well as a photo gallery on the Knock event. Pope Francis wrapped up in his long white coat touched down at Knock airport on Sunday morning descending the steps of an Aer Lingus plane called St Aidan. In fact, all the national carrier’s aircrafts are given the names of Irish Saints. He was greeted by hundreds of school children waving Vatican flags and smiling broadly as he patted them on the head. At the shrine itself people had gathered from early morning with many wearing plastic ponchos in an attempt to shield them from the ever present showers. Many here had been praying for good weather to make up for the rain that had poured down during the visit of St John Paul II nearly 40 years ago. After greeting the crowds gathered outside, the Pope entered this Marian Shrine and prayed in front of the Chapel of the Apparition, for all the families of the world, then in a touching gesture, he presented the shrine dedicated to Our Lady of Knock, with a golden rosary in acknowledgment of the tradition of the family rosary in Ireland. In an unprecedented gesture during the closing Mass for the World Meeting of Families in Dublin’s Phoenix Park, Pope Francis asks pardon for a litany of abuses committed by the Church against men, women, and children in Ireland. The Pope’s gesture was both unprecedented and unexpected. It came during the Penitential Rite, the moment within Mass when the celebrant and faithful acknowledge their sins, repent, and ask for mercy and forgiveness. Speaking in Spanish, Pope Francis asked pardon for a list of abuses committed by the Church in Ireland. He began by referencing his meeting on Saturday evening with eight abuse survivors and, on the basis of what they told him, said he wanted to “place before the mercy of the Lord these crimes, and ask forgiveness for them." The Pope’s prayer was translated simultaneously by his interpreter, Msgr. Mark Miles. Below please find a transcript of that translation. Yesterday, I met with eight survivors who have suffered abuse of power, conscience, and also sexual abuse. Taking up on what they said to me, I want to place before the mercy of the Lord these crimes, and ask forgiveness for them. We ask forgiveness for the abuses in Ireland, abuses of power, conscience, and sexual abuse perpetrated by members with roles of responsibility in the Church. In a special way we ask pardon for all the abuses committed in various types of institutions run by male or female religious and by other members of the Church, and we ask forgiveness for those cases of exploitation through manual work that so many women and men were subjected to. We ask forgiveness. Pope Francis urged the bishops of Ireland to “discern and set out on new paths for these new times” in the Church’s concern for the poor, the victims of abuse and in handing down the faith. Before flying back to Rome from the World Meeting of Families in Dublin, in Ireland, Pope Francis met members of the Irish Catholic Bishops’ Conference (ICBC) in the Convent of the Dominican Sisters. Ireland bid farewell to Pope Francis in a farewell ceremony at Dublin's international airport. AS I LEAVE IRELAND, I WISH TO EXPRESS MY GRATITUDE TO YOUR EXCELLENCY, THE GOVERNMENT AND THE BELOVED PEOPLE OF IRELAND FOR THE WARM WELCOME AND HOSPITALITY I HAVE RECEIVED. WITH THE ASSURANCE OF MY PRAYERS, I INVOKE UPON ALL OF YOU ALMIGHTY GOD’S BLESSINGS OF PEACE, FRATERNITY and PROSPERITY. Pope Francis has dismissed claims from a former Vatican ambassador that he was made aware of sexual misconduct allegations against Archbishop Theodore McCarrick. Francis urged members of the media to make a judgment about an explosive document released by Archbishop Carlo Vigano but that he will not respond to what it alleges. His decision not to engage with the contents of Archbishop Vigano’s document, in which he takes the highly unusual step of calling on the Pope to resign, is in keeping with Francis’s response to criticism from high-profile clerics inside the Church. He has repeatedly refused to respond to four cardinals who publicly released a list of queries, known as “dubia,” about his family life document “Amoris Laetitia”. Irish clerical abuse survivor, Marie Collins, expressed frustration on Sunday over her meeting with Pope Francis in Dublin along with seven other survivors. Speaking to the Tablet, she said that she had got “disappointing answers” to the questions she put to the Pontiff at the papal nunciature on Saturday afternoon. Collins, who was abused by a Dublin priest when she was 13, said she had spoken to the Pope about the Pontifical Commission for the Protection of Minors. She resigned from the PCPM in March 2017 over the curial resistance to the proposals for reform the commission had drawn up, notably its call for an accountability tribunal for those in church leadership who cover up abuse. The Pope told Collins that he was happy with the PCPM now that it is fully integrated into the Curia and he said he felt this was a positive development. Another issue she found the Pope’s response disappointing was the matter of the accountability tribunal which she quizzed him about. Pope Francis: I found so much faith in Ireland! Pope Francis shares his thoughts about his Apostolic Journey as he speaks with reporters during the flight back to Rome on Sunday evening. “I have found so much faith in Ireland,” Pope Francis said at the end of his two-day visit to the land of Saints and Scholars. “The Irish have suffered so much from the scandals, but they know how to distinguish the truth from half-truths,” he said, reciting the words spoken to him by an unnamed Bishop a few hours earlier. And even if the healing process is ongoing, the faith of the Irish people remains solid. Although the Pope had gone to Ireland to celebrate the World Meeting of Families, the subject of abuse cast a pallor over his visit. In particular, reporters were waiting to hear Pope Francis response to allegations made by a former Apostolic Nuncio (papal ambassador) to the United States. In a document published overnight Saturday, Archbishop Carlo Maria Viganò questioned the Holy Father’s response to accusations against Archbishop Theodore McCarrick, forced to resign his cardinalate over “credible” and “substantiated” allegations of sexual abuse of a minor. Further accusations against McCarrick have subsequently been made known. Instead, the Pope spoke on a number of other delicate and complex topics, including how to try a Bishop accused of abuse. Gently rejecting the wish of Marie Collins – a former member of the Pontifical Commission for the Protection of Minors – the Pope said that a standing court such as the one called for in the motu proprio“Come una madre amorevole” is not the best option. Rather, Bishops might be tried by an ad hoc tribunal on a case by case basis. “It functions better that way,” the Pope affirmed, noting the trial of the Archbishop of Guam had been handled in this manner. He also indicated another trial was proceeding along the same lines. Page created in 5.486 seconds with 19 queries.